JointSourcing Pro (“joint venture” + “insourcing” + “professional services”) is a complete, one-stop marketing program that provides everything professional services firms need to grow their brand and revenue: all the people and technology, management and strategy required to develop, implement and manage a custom marketing program. JointSourcing Pro does it all and takes the burden of hiring, managing and paying for a team of in-house or third-party marketing experts off your shoulders. With an emphasis on marketing strategies that build and strengthen personal relationships (including thought leadership, expertise marketing, networking, social media, brand building, video, and more), JointSourcing Pro is the marketing solution professional services firms have been looking for. 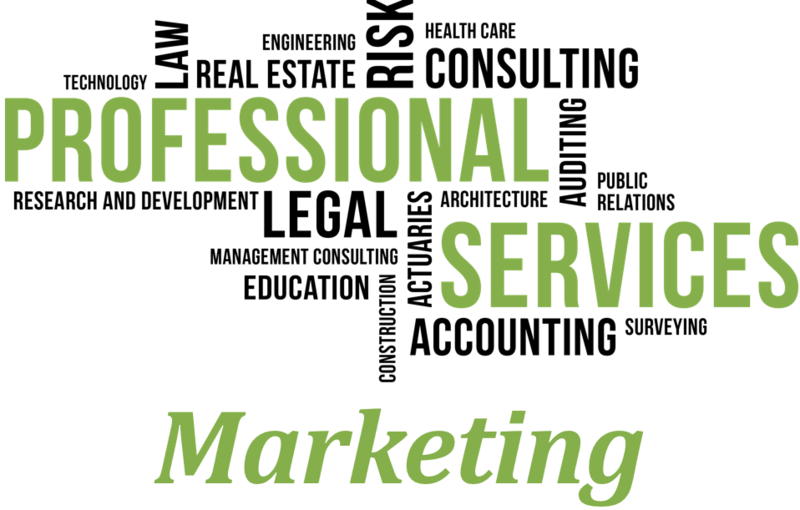 Marketing professional services is challenging. Establishing and cementing the relationship between the prospective client and the advisor—based on credibility, personality and trust—is far more important to new business development in professional services than it is in other industries. A key component of marketing these intangibles then, becomes brand building, in other words, building a compelling, recognizable position within your market using marketing strategies that showcase the individual, such as expertise marketing, thought leadership, in-person marketing and content/video marketing. Many professionals find it difficult to achieve the right balance between developing new business and servicing existing clients. Moreover, many are uncomfortable promoting themselves and when they do, often rely too heavily on their title or job description to try to convey what they do: this is neither memorable nor does it differentiate from everyone else with that title or description. The key to successful professional services marketing is to define and promote your expertise (to prospects, referral sources and your industry), effectively differentiate yourself from your competition, focus on the benefits you deliver, build a strong personal and firm brand, and commit to a consistent, well-balanced marketing program. In JointSourcing Pro, Sales Renewal will work closely with you to create and implement the optimum mix of marketing strategies and tactics for your industry and firm culture. It is a good fit for any professional services firm that wants a comprehensive, integrated marketing program to grow its brand and practice without the cost in time or dollars of hiring, managing and paying for a team of in-house or third party marketing experts. For many small- to medium-sized professional services firms, a particularly daunting challenge with marketing is its cost, in both time and dollars. 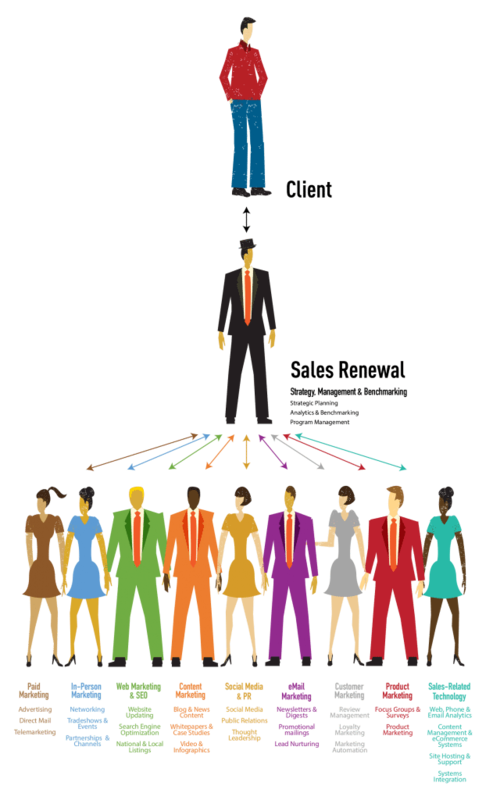 Many firms have little or no in-house marketing capabilities, and the breadth and depth of expertise needed to create an effective in-house team can be cost-prohibitive for any but the largest: consider salaries, benefits, and training costs in a constantly changing field. Alternatively, firms can hire a stable of outside, fee-for-service firms each delivering a single marketing tactic (e.g., PR firms, ad agencies, trade show consultants, etc.) but that is even more expensive, plus, it is very challenging and time-consuming to manage multiple third-parties at once. Add in the opportunity cost of time spent on marketing by the professionals themselves, and the costs can seem overwhelming. That’s why in JointSourcing Pro, Sales Renewal acts as a Marketing General Contractor who “insources” a custom, self-managing marketing department into your firm: a complete marketing team and all the needed technology plus a CMO for strategy and a Director of Marketing for management. This allows Sales Renewal to manage the day-to-day marketing (freeing up your time) while you are still in control and make all the key decisions. JointSourcing Pro pairs this insourced team with two possible compensation models. The first is a shared risk and reward model, where we earn a percentage commission on revenue and, importantly, pay that same percentage of the big ticket expenses we recommend. Together, these motivate us to grow sales cost-effectively and are the “joint venture” aspects of JointSourcing. The second, for clients who may face regulatory restrictions on paying commissions, JointSourcing Pro can also operate under a traditional, fee-for-service model.